I was invited speak at the Maths Mastery conference in London last month. My essential brief was to engage with using technology to support mathematics learners. I have increasingly wanted to take a wide view of things so I interpreted technology very liberally. Having trained teachers in using graphing calculators for both TI and HP for many years, I am well versed in the language of multiple representations. The possibility is there to see a function represented graphically, symbolically and as a table of values and to swap quickly between them and to see how each representation gave you different insights into the nature of the function. For example, a linear function has a particular algebraic form, it has a straight line graph and a table of values with a common difference. We exploited all of these in our Pizza project, showing that the natural tendency when watching change over time (the declining temperature of a cooling pizza) is to look for a linear change. The difference is roughly equal over the minute intervals we used, for the 10 minute length of the experiment. This is forcefully confirmed visually when a real time graph being drawn is very nearly a straight line. So, we feel empowered to hypthesise a linear function which symbolically can be used to calculate extrapolations. It is these that undermine our initial thoughts (put time = 24 hours into the function and we quickly see there is something wrong). Then we can go back to the graph and change the axes to see the nature of the slight curve and look again at the nature of the differences from equal differences, which themselves have a pattern. It is clear that this notion of multiple representations runs throughout mathematics mastery. Having run ATM branch for such a long time it is good that the Singaporeans who kicked the mastery thing off did fully acknowledge that all they were doing was recovering the work of the founders of the ATM. The ATM started as the association of teaching aids in mathematics. The teaching aids of Cattegno, Dienes, Cuisenaire et al. had largely been removed from school classrooms, especially in secondary schools, but are now making a welcome return. The physical manipulative is a powerful representation. Converted to a picture of itself it is a diagram and both of these represent some number or calculation or more. Teachers show pictures of things and assume they are the thing. A picture of a chocolate cake is not a chocolate cake. (Ask Magrit for more on this and let the NCETM know). A graph is not a function, nor is the symbolic representation. Developing mathematicians need to learn the art of switching views. So, teachers need to give them opportunities to do so. So, we have computer technology, manipulative technology and I finished with human technology. The learner experiencing the mathematics within themselves. I started with the classic maths gym where everyone holds their arms in the shape of different graphs. I do linear functions varying a and b in f(x)=ax+b (after some errors, everyone knows what the a and the b do) and then quadratics f(x)=ax²+bx+c (here everyone knows what the a and the c do. But what does the b do?) It is always good to find out what you don’t know. Feeling it within yourself is however a powerful experience. More dramatic (but in truth I only got enough time to say it), is to solve puzzles as a human team. The frogs puzzle and the tower of Hanoi (correctly the tower of Brahma) where a team each play the part of one of the pieces. No communication of any kind is allowed. So, you have to feel your own part in the process. This yields insights of a qualitatively different type than is possible doing the whole thing yourself. Teams have done this in the Mayor’s Fund’s count on us challenge (that I run for them) and become so good we had to abandon it. 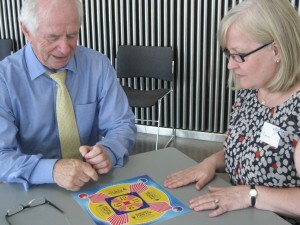 We now get teams to compete as the counters in a game of Hex on a 4 by 4 boards (drawn with huge hexagons on the floor). They still find this nicely hard. Try it. So, take a wide view. Mastery is rooted in multiple representations (and in the ATM), but the technology that can be used to represent them are many and varied, as are the representations themselves. Count On Us Challenge: Congratulations to Kender School! Kender School in Lewisham are the winners of the Mayor’s Fund for London’s Count On Us Challenge. 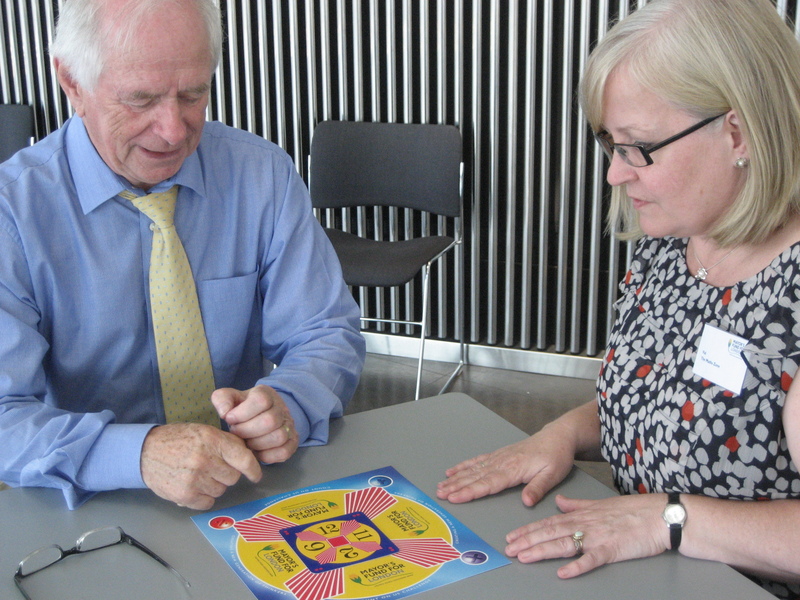 Val takes on Johnny Ball! IT supporting kids learning in maths: what is the problem? I completed my PGCE in 1983 (oh my!) and went to work in a comprehensive school in Corby new town in the East Midlands. (Then it was the largest town in England without a railway station, somewhat depressed by the closure of the largest steelworks in Europe). The walls of my classroom had a large bench running all the way round. On this bench were set out about 8 RM 480Z work stations. For anyone who doesn’t remember, these were competitors to the BBC Micro. When I taught transformational geometry, I could pause in the lesson and get my students to gather round the computers and engage with an activity I set up for them where they would create a shape and transform it using LOGO. They would make hypotheses and test them, seeing the result immediately, visually, dynamically. I have recently observed a number of lessons on transformational geometry in London comprehensives. Despite every classroom being fully equipped with a networked computer and an interactive whiteboard and in every case, the teacher having been trained within the last year on using GeoGebra to teach transformational geometry, not one single diagram moved at all in any of the lessons. Students were shown object and image and asked what transformation connected them. An agreement was reached (often with much disagreement and uncertainty) and that would be that. There was no way that anyone could validate the agreement or see the transformation enacted. This is the traditional teaching method of ‘proof by teacher says’ or its slightly more inclusive counterpart ‘proof by agreement’. Now, just in case anyone who was there in the room with me can recognise themselves, I should share that everything else about all of those lessons was really good, sometimes quite outstanding. It is simply that giving kids experience of the mathematics, rather than showing them how it works, seems to be such a long way from conventional school practice, that even with everything else in place, teachers find it hard to achieve. Yet in 1983, it was just what you did and we had reliable technological tools ready in the classroom to support it. I have had lengthy discussions about technology in the classroom with colleagues in teacher education and most recently I have heard about the various classroom manager systems that are being developed by the hardware companies and the IWB people. The essential premise is that you connect to handheld devices that the students have. The screens of their devices are available in thumbnail format on the teacher machine and hence the classroom screen (and able to be enlarged to show the whole class the work of an individual). The software has polling and analysis, so questions and messages can be sent and answers received and engaged with. With this level of technology available, it will again be possible to do what I was happily doing in 1983, interrupting an ordinary lesson in an ordinary classroom to engage with an idea dynamically using technology and seeing what the students are doing (I wandered round and looked at the screens and if I saw something interesting, I got the others to come over and see). At the moment, teachers feel they have to book the computer room to achieve this effect and we all know how unlikely/impossible that is. But it is a compelling thought. Now, the teacher can manage the dialogue, setting a task, students can engage with the software and discuss the issues. When ideas emerge these can be shared with the whole class. A real dialogic engagement. So, what’s stopping us? Wheel the trolley of laptops in and they will connect seemlessly to the network with no fuss and then it’s OK? Of, course it doesn’t/won’t. Not least because controlling dynamic software from a track pad is a nightmare, but have you ever made a half class set of Laptops connect to a network? So, bring in the set of iPads the school just massively invested in. Agh. No manager software and as yet only a very cut down version of GeoGebra. The Holy Grail is that everyone turns their smart phones on and launches the iOS or Android app they need, and we get some generic tablets for those that don’t have smart phones and these all connect. Even then we would need better software (unless you invest £30 a head for TI-nspire on iOS which is really good). 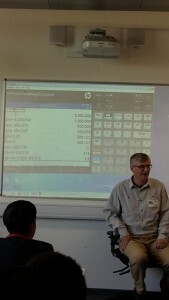 I hope to get delivery of a trial set of HP Prime wireless graphing calculators very soon. Naturally, they do everything that that I have said. The massive difference is that they have an auto detecting dongle (the same as the ones that make wireless keyboards work). No installation, no logging in, if the device is in the room, the screen appears on the teacher machine. People say: ‘what’s the point of graphing calculators these days?’ I say: it is a piece of bespoke hardware with an optimised interface for the range of maths functions you need, with really well developed and well thought out maths software. Moreover, compared to iPads they are really cheap. They are small, easy to carry and importantly easy to charge. You just have to be able to grab the box on your way into lesson and hand them out the same as you would hand out rulers and compasses and they just work when you turn them on. Only then can we get back to 1983 and have technology seemlessly integrated into ordinary lessons in ordinary classrooms. Only now we’ve got rather classier software to play with. I would like to work with anyone who is using any comparable kit that can achieve the same effect. I would be delighted to set up a research project where we can examine the actual classroom use of these technologies. I would be keen to hear from schools who think that this sort of kit will solve the problem of static teaching and would think they could use such technology all the time (not just special occasions). I would happily support such work with loan equipment and support materials. Contact me (chris@themathszone.co.uk). Apart from the dodgy hairdos and the rusty cars, 1983 had things going for it! EAL in Maths? Problem Solved! Where we were working in South East London, a number of students would arrive in England for the first time in the middle of secondary school. They would have very little English language and would try to get into local secondary schools. The schools would turn them away because they assumed that these students would end up with poor grades and compromise their exam statistics. So, a unit was set up to support these students make the transition to school. I got together with Gwyn Jones to produce a course designed to teach the mathematics content of GCSE with the minimum of language, but developing the key technical vocabulary of maths and of school while they learnt. The materials were supported by online interactives to see the maths dynamically and practice the ideas in an open format. There was a very low language pre-test, so that the student could show what they already knew, a tracker sheet to choose the maths they now needed to work on, a large collection of activity sheets to develop the maths and a post test with the same language demands of a normal maths test to show the schools how good they were. In the very first group of students to use the first version of materials there was a student who had just arrived from East Africa. He had been rejected by every school in the borough. He took the pre-test and got 100%. He worked on the advanced materials and did the same on the post test. He took his work as a portfolio back to the schools and immediately found a place. Within 18 months he had an A* in GCSE maths. We are proud to announce that we have now redesigned and updated this course and made it available to schools. Called Access to Mathematics it comes as one of our course boxes (like our well known gifted and talented courses; Wondermaths and Illuminate). There is a comprehensive teacher guide with notes on running the course. Ten copies of the comprehensive student book (120 pages) and access to the online interactives, test, answers, etc. in the Access to Mathematics web site. Priced at £195 this gives access to mathematics for all of your students for whom English is an Additional Language from those who have just arrived with no English to those who appear to have conversational English, but cannot access or succeed at maths in lessons. Everything is described diagrammatically, putting the maths into a visual structure. Two colours are used to emphasise the structure and the maths is practised through this structure, gradually peeling it away to leave the formal symbolic maths. The course worked well supervised by non-specialist teachers as it is designed largely for self-teaching. However, with access to a specialist teacher, the materials could be used for a whole range of learners where reading and language demands of any sort are an issue. Once you have the box, further copies of the students books are available in packs of 10 priced at £45. So, you can use them as a standard class text if you want. The overall content is covers about 90% of a higher level GCSE. We are very proud of this publication. We have so often seen excellent mathematicians languishing in low achieving sets simply because they are still learning English and find accessing conventional books difficult. Now, they can quietly and quickly show everyone how much they know and can do, while learning the essential school language that they need.